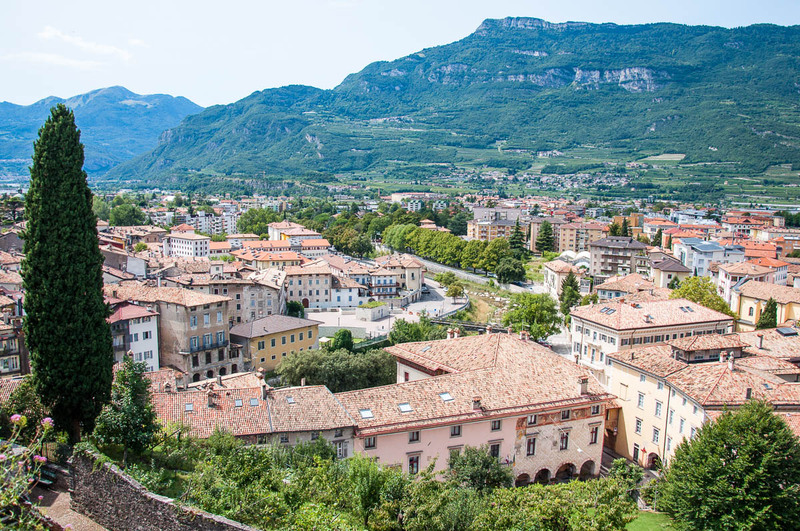 Rovereto is a lovely city nestled at the southern edge of the Italian Alps just off the top end of lake Garda. Part of the Northern Italian region of Trentino, it is a place that has repeatedly changed hands through the centuries, counting Austrians and Venetians among its rulers. 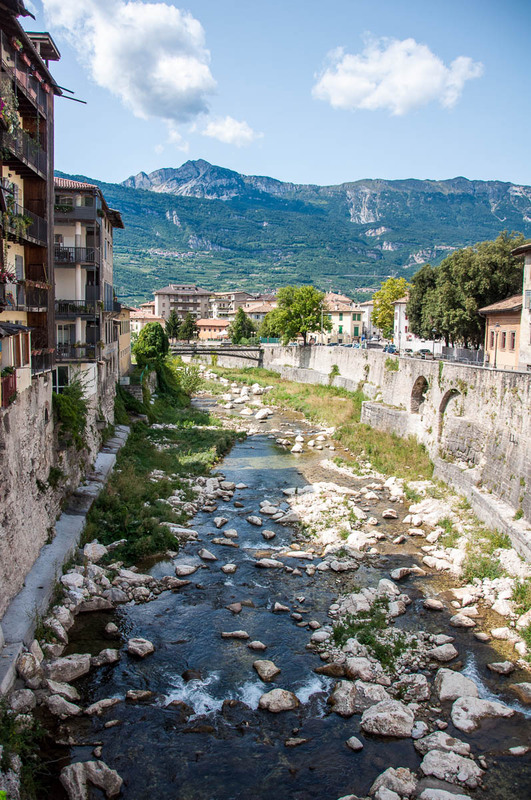 Surrounded by mountains and with the mighty river Adige rushing past it, Rovereto offers a picturesque respite if you long to escape the oppressive summer heat. Yet, its charms stretch far beyond the cooling breeze which caresses the city. the home of one of Europe’s most important museums of modern and contemporary art. 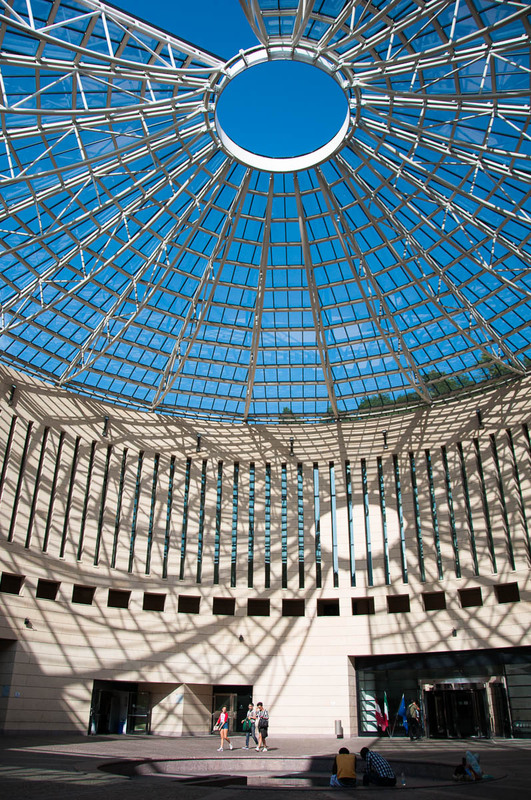 Called MART (Museo d’Arte Moderna e Contemporanea di Trento e Rovereto), it has an impressive collection and an equally stunning building. 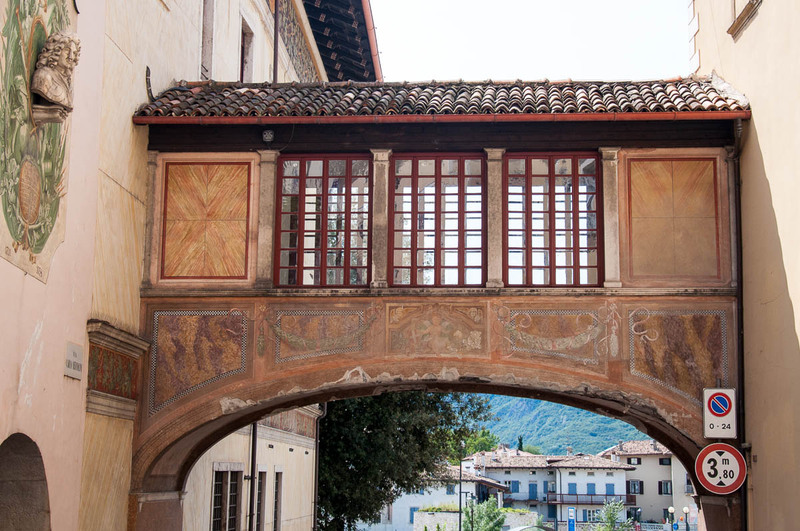 the birthplace of philosopher and Roman Catholic priest Antonio Rosmini who would amble through the pretty streets of Rovereto deep in thought while developing his Idea of Being which is at the base of his philosophy system. the birthplace also of the Italian futurist painter, writer, sculptor and graphic designer Fortunato Deperó, the vibrant work of whom made a huge impression on me. a truly beautiful city with richly frescoed buildings, quaint squares, a coffee museum, a castle (nowadays hosting the Italian War History Museum), a torrent with a weir and many more small and large details, personalities and stories which make it a great place to visit and explore. After all, this is the city, the surroundings of which were mentioned by Dante in his Divine Comedy and which was visited by both Mozart and Goethe, the former of which is locally celebrated every year in the shape of a musical festival. So, after an inspiring day spent in Rovereto, I am now here eager to take you on an impromptu photowalk and share with you 20 of the many photos I took there in order to (if you haven’t already) help you discover this Northern Italian city and make you fall in love with it as much as I have. 1. This lovely Virgin Mary adorned the wall of one of the first houses in Rovereto which I saw straight after walking out of the local train station. You know that trepidation which takes hold of you when you arrive on your own at a place you don’t know much about?! That sudden whirlpool of worry and expectation when you start doubting your travel choices?! Well, I was rather stuck in my head wondering if it had been the right choice to visit Rovereto when I spotted this rather pretty majolica piece. 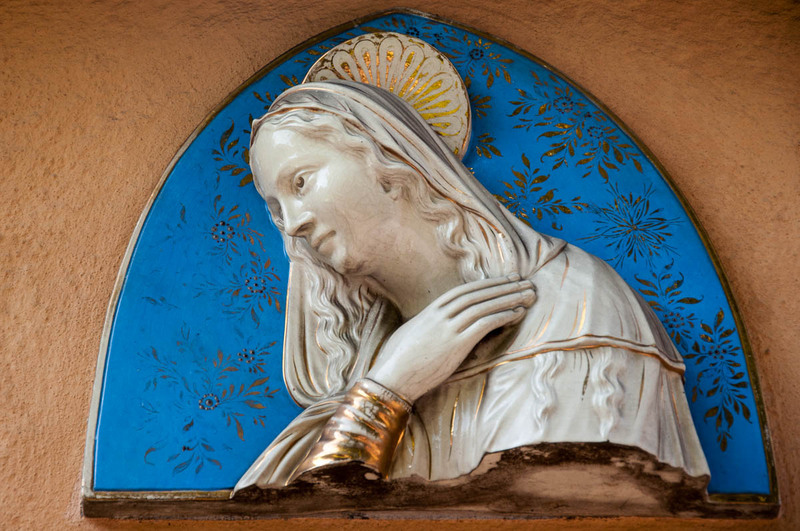 I loved the contrast of the colours, the gentle pose, the serenity which seemed to flow from the Virgin’s gaze. It made me feel much calmer and turned my thoughts away from the feelings of self-doubt and back onto the main purpose of the day ahead – the exploration of a brand new place. 2. Here is a lovely cup of handmade gelato I had for breakfast at an award-winning local gelateria. 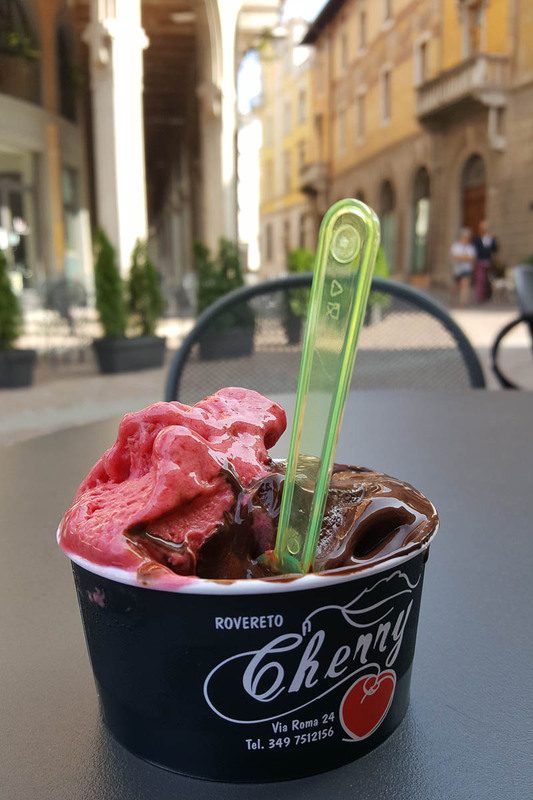 I asked the owner and master gelato-maker what combination of flavours to try and he suggested either dark chocolate and raspberry or pistachio and strawberry. I picked the former. It was really good! I actually can’t find the words to express how nice that gelato was. Sitting outside in the gentle morning breeze I took my time enjoying it whilst my eyes feasted on the first of many richly frescoed buildings in Rovereto. 3. Guess what this building is?! It’s a bank! A bank, I know! I could not believe it. I wish all banks were… No, scrape this! I wish all buildings were this beautiful! I spent, perhaps, close to half an hour simply looking at it in awe from every possible angle. It was exquisite and the more I looked at it, the more detail I could see. All the while, local people would come in two’s and three’s to withdraw money from the ATM inserted in the corner of the building. It was quite surreal. 4. Here is a close-up of the richly frescoed surfaces of the colonnade of the above building. Yes, the bank! 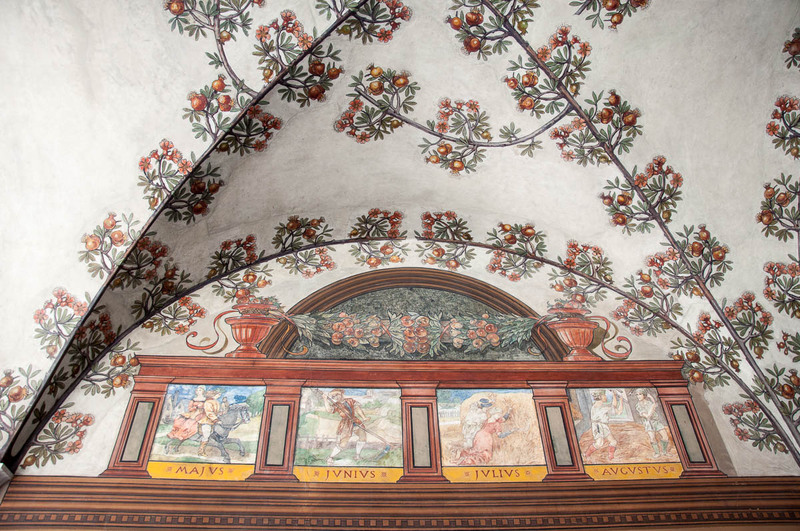 Inside its colonnade there was a beautiful cycle with pictorial representations of the twelve months of the year. Well, it being summer, have a look at the images for the months of May, June, July and August. 6. Well, walk to the other side of the same Ponte Forbato and you can enjoy this! A splendid view, isn’t it?! This is still the torrent Leno but with a weir and without the boulders. Any illusion you may have had of it as a slow running course of water is quickly shattered by the mighty rumble the weir is making. The water flows fast and furious and you start to understand why the Leno and its hydraulic power used to be so important for the development of the area. 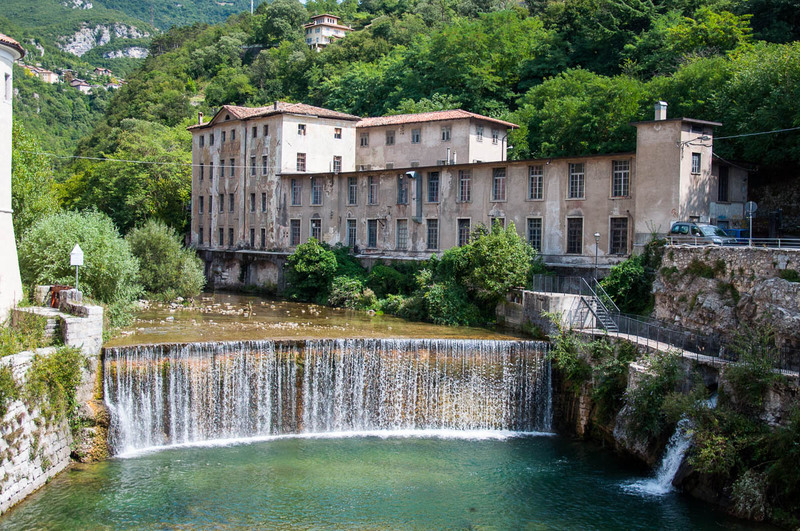 It is a beautiful spot in town and definitely don’t miss it when you are in Rovereto. 7. Water is everywhere in Rovereto and not just in the shape of a river. 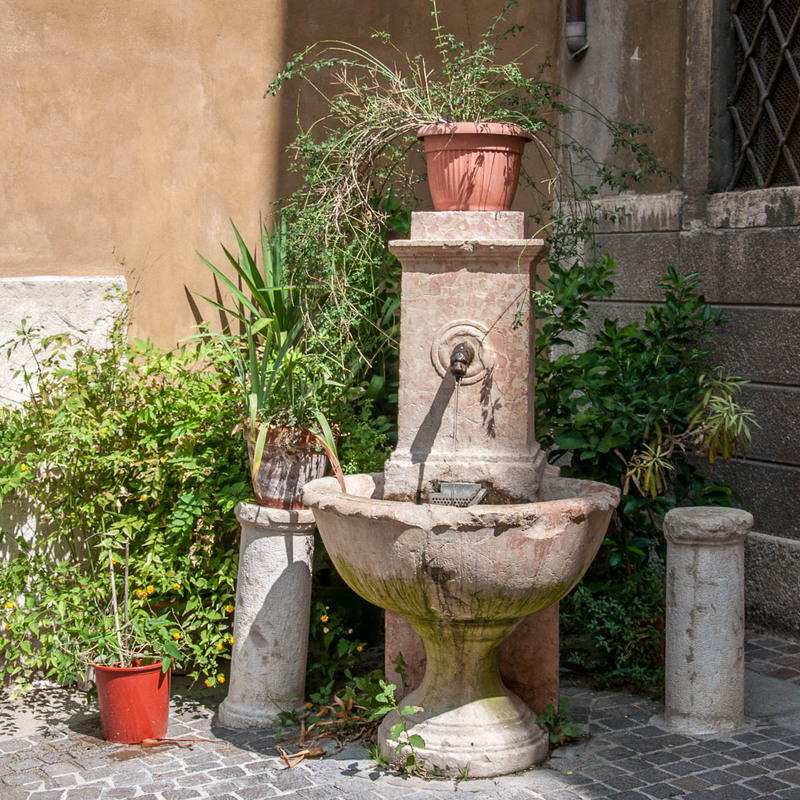 The city has styled itself as the ‘città dell’acqua’, so stone fountains with free-running water are dotted all over the historical centre. They are a welcoming sight in the hot summer afternoons when the burning rays of the Italian sun take over from the cool mountain breeze. 8. There are also a couple of decorative fountains (so, please, don’t drink their water! ), the most interesting of which is the Fountain of Neptune. 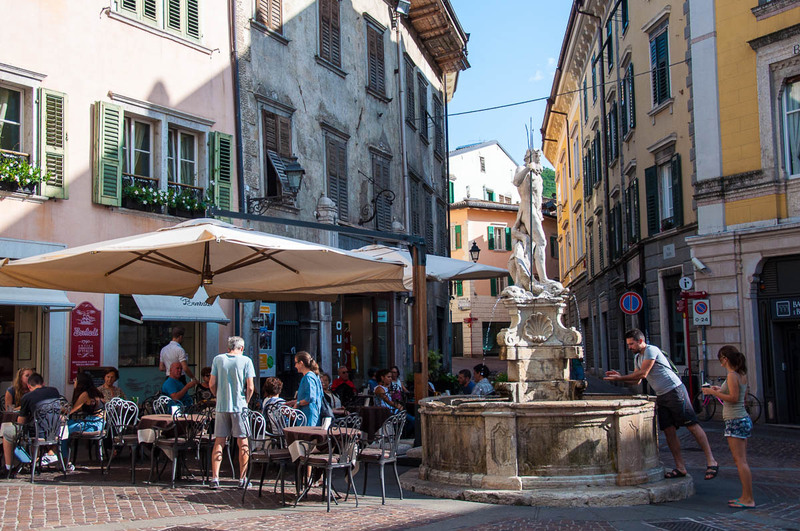 It’s a small one, let’s be honest here, but it is the central point of a rather charming square – Piazza delle Oche, which serves as the focal point of the historical centre. The statue of Neptune dates back to 1736 and it has been in its current fountain-position since 1976. 9. The cafe right behind the Fountain of Neptune is called Bontadi and it has been in the coffee roasting business since 1790. Nowadays, it not only serves a large variety of fabulous coffees, but it also has its own barista academy and coffee museum. The museum is just up the street from the premises of the cafe itself (ask the staff and they will point you in the right direction). Bear in mind though that on Saturday afternoon and all-day Sunday the museum is only open by appointment. It has a large selection of coffee-making machines and paraphernalia and it is a very curious place to see, especially if you simply love coffee. 10. 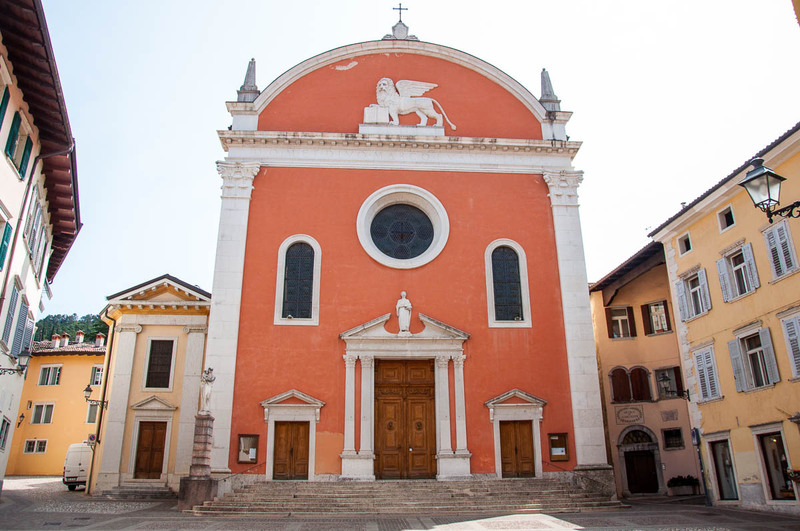 Once you have had your water, coffee and gelato sorted, it is time to indulge in some serious sightseeing, so don’t miss the splendid St. Mark’s Church which is on a quaint and sunny piazza of the same name. Inside the church is decorated with frescoes and gold stuccoes and has large marble altars dating back to the 17th century. It is a beautiful place to experience and on Sunday afternoon it is completely deserted, so that you can sit in and spend a moment of silence and prayer. 11. 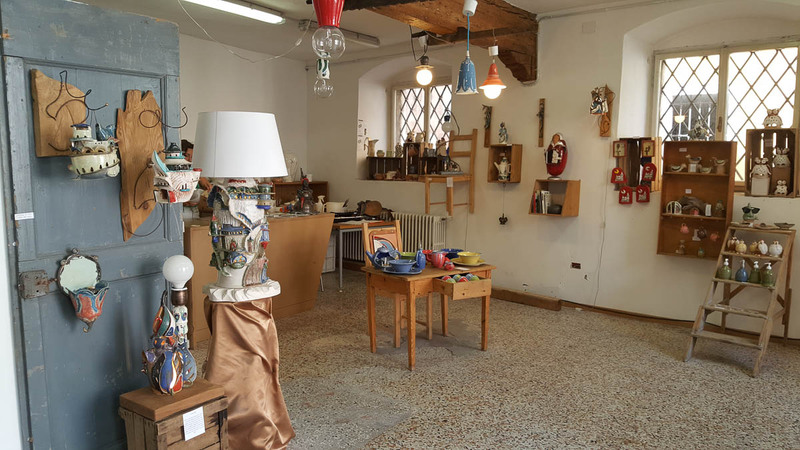 On the corner of St. Mark’s Square and Via della Terra don’t miss the whimsical ceramics shop and studio also called ‘Via della Terra’. It has some really gorgeous and creative pieces. I couldn’t leave empty-handed, hence a lovely pot decorated with a swallow is now taking a pride of place on the shelf at home. 12. A tall and proud clock tower overlooks the ancient Via della Terra. It was erected in 1500 on top of one of the gates in the original city walls which were built in 1300. 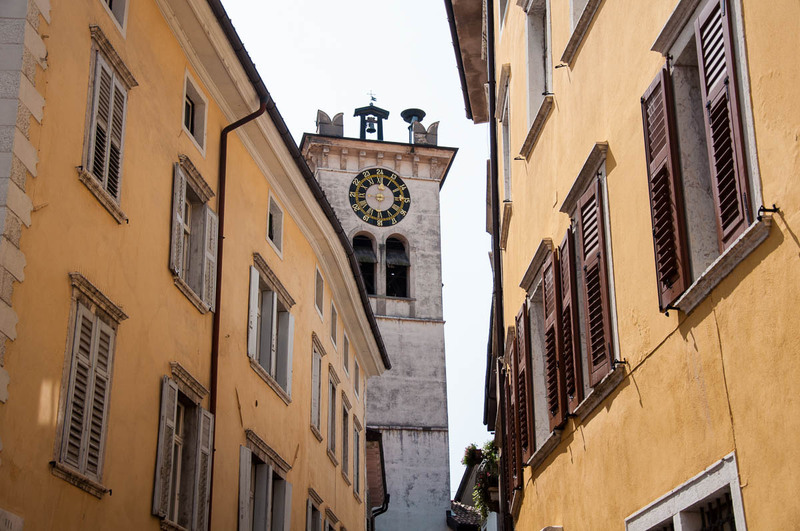 The clock itself has been tick-tocking in the tower since 1519 and for centuries the good people of Rovereto (called ‘roveretani’) would listen out for its signal marking midnight and then the beginning of the school day for the city’s children. 13. All streets and squares in Rovereto have these rather lovely street signs. 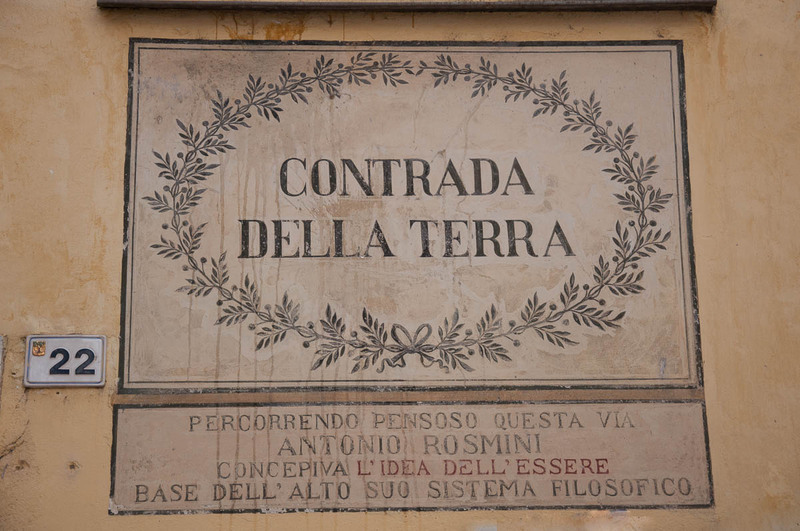 On Contrada della Terra you will also notice a second sign marking the fact that the philosopher and Roman Catholic priest Antonio Rosmini would walk this street deep in thought whilst formulating his idea of being. Apart from his Principle of Passivity, Rosmini is also famous for founding a new religious community – the Institute of Charity, known as the Rosminians. 14. Another illustrious son of Rovereto is the futurist painter, writer, sculptor and graphic designer Fortunato Deperó. Don’t miss his amazing Futurist Art House nestled in the heart of the city’s medieval historic centre. At Via dei Portici, 38 you can see a rich exhibition incorporating some of the 3000 objects of art which the artist left the city. It was my very first encounter with Deperó and his art and I was fully captivated. To think that he lived from 1892 to 1960 and yet possessed such an unparalleled vision which is so revolutionary not just for his time but for our time, too. 15. 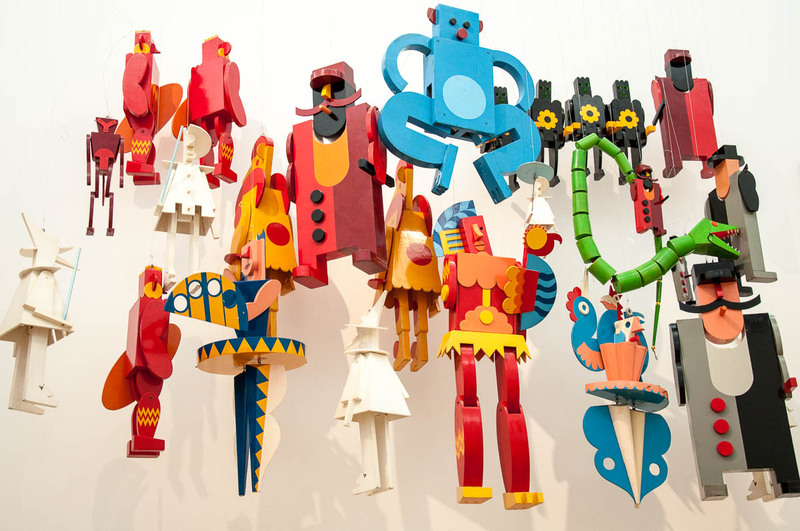 I loved seeing these toys which Deperó designed in the 30’s of the 20th century. Apparently, at the time they were deemed ‘inconceivable’! 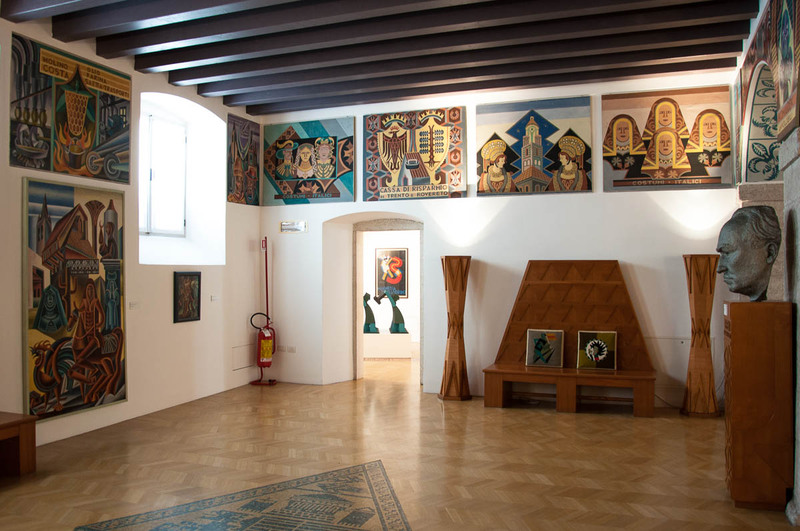 Fortunato Deperó Futurist House of Art also hosts temporary exhibitions on its top floor, so make sure you include it in your Rovereto itinerary. 16. Make sure that you put an hour and a half aside for a visit to the Italian War History Museum which is housed in the Castle of Rovereto. Both the castle and the museum exhibition are worth it of a detailed look. Among many war-related and heart-wrenching artifacts, there you can also see the plaster model of the Bell of the Fallen. 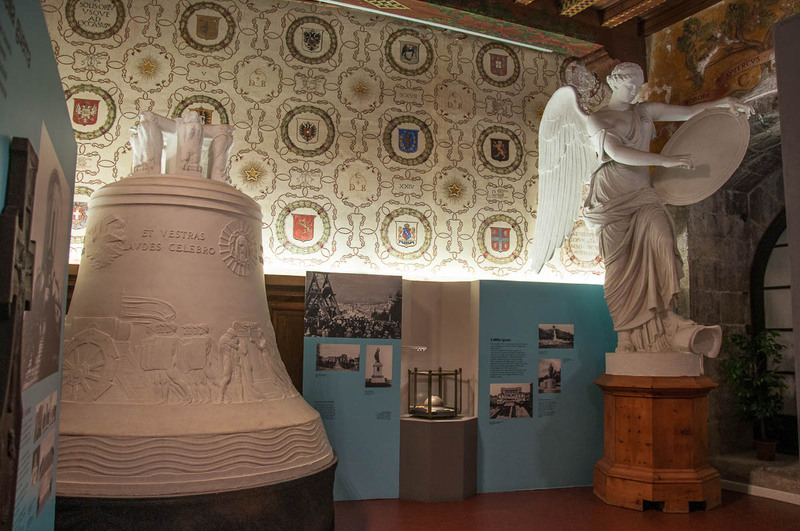 Originally cast in 1924 with the bronze of the cannons of all the nations which participated in the First World War, this is the largest bell in the world to sound at full peal. It rings every evening at dusk on the Colle di Miravale over the city of Rovereto commemorating the fallen soldiers. 17. 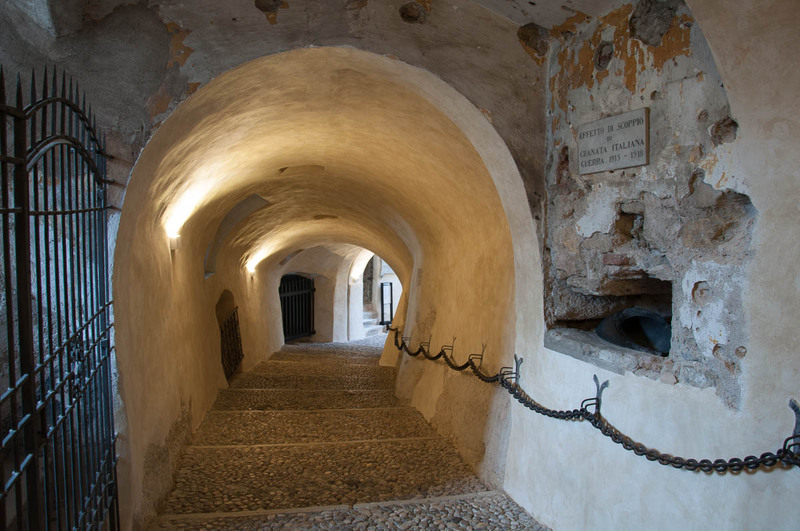 This is the corridor in the Castle of Rovereto which leads up to the exhibition of the Italian War History Museum. The castle was originally built by the Castelbarco family (a feaudal dynasty with ties to the courts in both Trento and Verona) in the 14th century. In the 15th century the castle fell into the hands of the Venetians which re-structured it into a military fortress. Its round defense towers are called Marino and Malipiero and the castle has seen several vicious battles. Since 1921 the castle has been turned into the Italian War History Museum. 18. 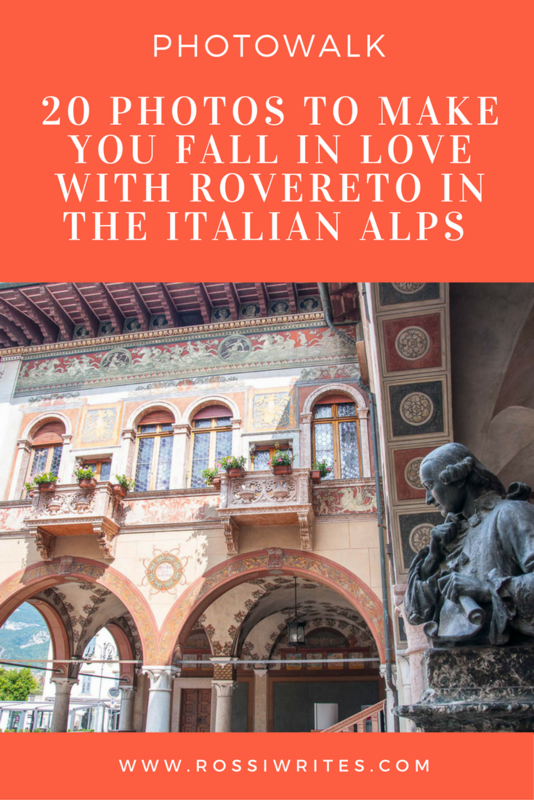 Very near the Castle of Rovereto (in fact, you can see it from the castle’s balcony) is the Palazzo Pretorio which serves as the seat of the council of Rovereto. It is a beautiful building covered with somewhat faded but still splendid Venetian frescoes. I, personally, loved this little bridge/hallway connecting the different parts of the palazzo. 19. Don’t miss MART. Or, in other words, the Museum of Modern and Contemporary Art of Trento and Rovereto. It is housed in a beautiful building with a whimsical covered courtyard at the opposite end of town from the Italian War History Museum. By the way, you can get a combined ticket for MART and the Futurist Art House of Fortunato Deperó. It costs 14 euros. 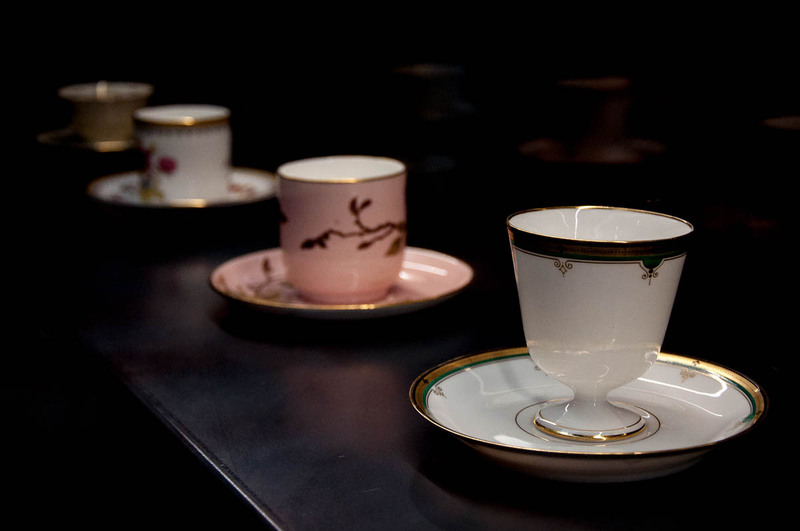 Just make sure that you leave enough time to see them and unhurriedly enjoy their collections. 20. And, finally, here is a photo of Rovereto from above. This is how I saw it from the tall bastions of its castle. Rovereto turned out to be a beautiful and very interesting city. It surprised me on so many levels and even though I spent there a long day taking so much in, there were still things left unexplored. A second and even a third visit definitely need to be penciled in and I am looking forward to returning there and feast my eyes and soul again on the beauty of its frescoed buildings. 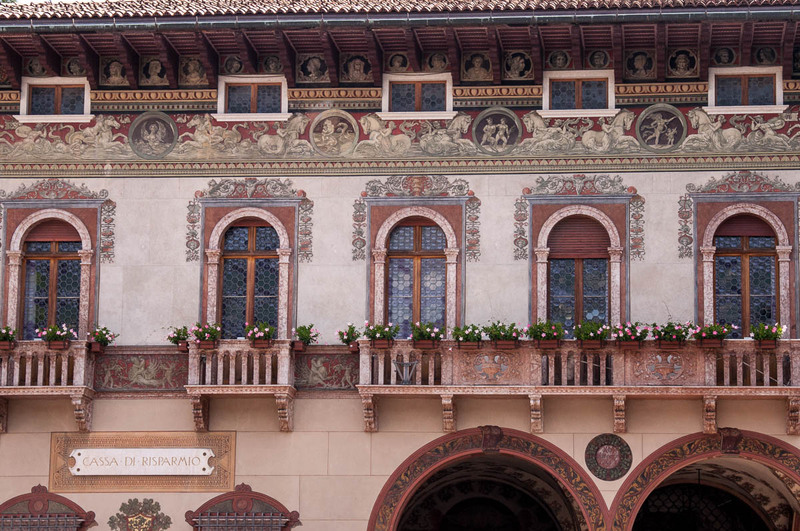 Have you been to Rovereto or anywhere in the Northern Italian region of Trentino? What did you like best there? Can you share any recommendations for any future visits?